Award-winning yacht and fibreglass boat builder Gulf Craft, boasting a discerning clientele within the Gulf and outside the region, has launched the newly renovated Silvercraft 31 HT, featuring higher engine capacity, better utilisation of space, and more ergonomic features. With rigorous research, and the incorporation of valuable customer feedback, the beloved Silvercraft 31 HT has been revamped to further enhance the overall customer experience, inspired by the region’s passion for family days out on the sea and fishing trips. 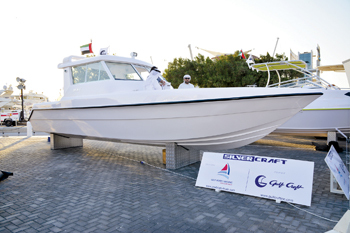 “We never rest on our laurels here at Gulf Craft. In addition to creating pioneering products that fulfill new demands and market needs in the ever-evolving yacht and boating industry, we are committed to uncovering ways to improve our customers’ journeys through our existing offerings,” said Erwin Bamps, CEO of Gulf Craft. “Specifically designed with regional fishing hobbyists and family boating in mind, our engineers and architects critically evaluated every corner and feature of the Silvercraft 31 HT to determine how we can make better use of the boat’s surface space. In the process, other fine details were added which has resulted in a beautifully transformed, and exceptionally practical craft, with the potential to offer customers even more enjoyable trips,” said Bamps. Maximising the comfort and functionality levels on-board, a key modification in the new edition of the boat is the substantial increase in storage space, allowing passengers freedom to bring additional equipment and supplies to help prepare for a more comfortable journey. The cockpit seats can now be temporarily folded away to provide more surface area when needed, a number of cabinets have been added under countertops, a net holder has been fastened to store important documents requiring easy access, two small ice boxes have been removed in exchange for a single larger ice box, an additional forward seat has been installed, and even the headroom of the hard top has been expanded. For fishermen, the foldable seats allow for more space to hold catches, and the larger ice box can keep more fish fresh during the in-bound journey to land, while for family cruises, more storage space means passengers have more to munch on throughout the trip, and clutter on-deck is minimised, which can reduce safety risks. Other alterations include a fitted footrest in the console area, and the slide door on the bathroom that replaces the L-shaped swing door to allow for a hassle-free entrance and exit. Subtle changes in the appearance and fine detailing were also implemented as part of the Silvercraft 31 HT upgrade, presenting a more chic and modern appeal. Artistically contrasting the crisp whiteness of the deck, the interior furniture is well-finished using fine, yet durable fabrics. Measuring 9.4-m in overall length, and fitted with a 760-liter fuel tank capacity, the Silvercraft 31 HT can entertain up to eight persons and hold a maximum of 800 kg.